Each tourist spot represents a distinct beauty and story. In Southeast Sulawesi Province, Adipura Monument serves as both a tourist lure and a symbol of the value of Konawe Regency. The location is in Ambekairi Village. The local government constructed the monument to commemorate the cleanliness award of Adipura. 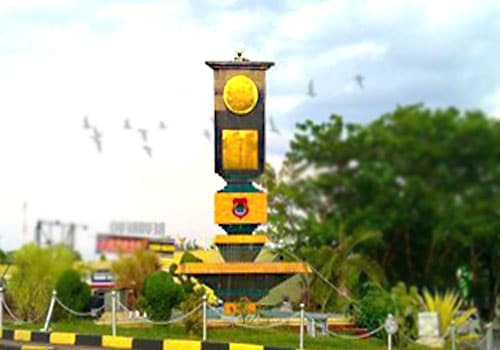 It is because Kendari City had ever obtained such award back then. Due to this reason, all people living in the city should be proud of it. Not to mention the monument becomes a place to gather with families and friends. In terms of size, the monument is moderate. It has a simple design just like other regular Adipura Monument. Still, it is surrounded by some plants and flowers. The local government made it as attractive as possible to tourists. Today, visitors can enjoy good times there. In the roadside, there are trees. They give a refreshing nuance to this location, so visitors can feel comfortable and peaceful. When it comes to the weather, it is nice and sunny. Make sure to come at the right time, though. Summer is the best choice. Somehow, Adipura Monument becomes the pride of Kendari City. It represents how neat and clean Kendari’s environment is. In fact, the city has obtained both regular and Kencana Adipura in the past 8 years. No wonder, the government constructed a monument to show how grateful they are. Today, it becomes a tourist lure both for the locals and outsiders. Many visitors come to the location either to relax or take some pictures. The monument serves as a place for gathering, as well. The best time to visit Adipura Monument is in the afternoon. Usually, the locals come before the dusk. They chat with friends and spend good times together. As an alternative, you can come in the morning. It is because the weather is nice. Not to mention you can take advantage of the fresh weather to perform jogging and exercises near to the monument. One thing, you should pay attention to the traffic. It is because the monument is located in the roadside. Not many vehicles are seen in the morning, though. As for the tips, you should carry a camera. It is a waste if you don’t take a picture of the monument. At least, you must carry a phone with you. Take a picture of it with a camera of your phone. It is definitely worthy. Later, you can show it to your friends or families. This becomes a good type of promotion, so more visitors would come to see the monument. For outsiders, the first destination is Kendari City. Once you get there, it is time to reach Konawe Regency. Adipura Monument is located in Ambekairi Village, Unaaha, Konawe Regency, so it becomes your next destination. The best route to reach the location is Poros Unaaha – Pondidaha Street. The trip takes about 2 hours. The distance is 80 km from Kendari City. Many local transportation services are available, so you don’t need to worry.